Renewed attention to nuclear propulsion (NP) for interplanetary missions started in the late 1980s, motivated by interest in a manned Mars mission. It was and still is clear to the aerospace research community that NP can provide the only practical and safe propulsion system for a fast, manned Mars mission, e.g. [Asker, 1991]. Many brief (and cautious) articles have appeared in support of high-energy, short missions compared to multi-year missions relying on planetary gravitational assists such as Galileo or Cassini, e.g. [Borowski et al., 1989; Beale and Lawrence, 1989; Jones, 1992; Asker, 1991; Schmidt, 1999, 2001; Howe, 2001; Lenard, 2001; Hrbud, 2003]. Running against this trend, public acceptance of anything nuclear ebbed away in the 1980s and 1990s. Until recently the issue of nuclear propulsion could not even be discussed at the political and decision-making level: nuclear propulsion and anything nuclear, whether in space or elsewhere, remains to this day a controversial topic [Hagen and Scheffran, 2001]. This state of affairs is slowly changing; a joint JPL-NASA meeting held at JPL in the summer of 2000 [Sackheim et al., 2000] was instrumental in revealing the tide was turning, and so was also the increasing public consciousness of the greenhouse effect caused by power generation based on fossil fuel combustion. 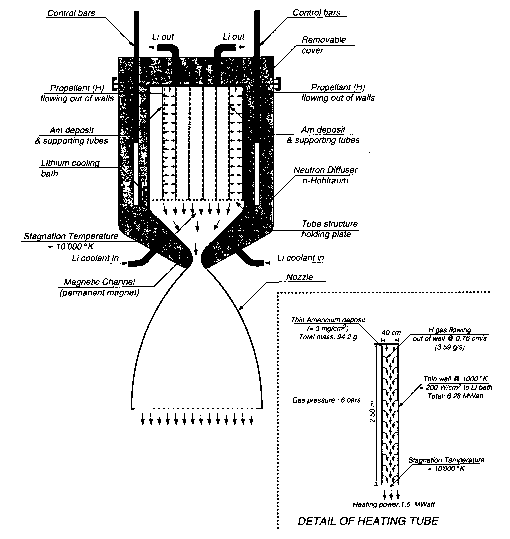 After the joint JPL/NASA-Marshall meeting in May 2000, NASA proposed nuclear power as a technology not just for nuclear thermal rocket, but for a broad gamut of thrusters, ranging from conventional NTR proposals by NASA-Glenn [Borowski et al., 2000] to pulsed fission systems, and even eventually utilizing some form of fusion [Sackheim et al., 2000]. In this framework the original concept of "nuclear propulsion" is replaced by "nuclear powered thrusters'', these being thermal, like the original NERVA, electric (ion), or embodying magneto-plasma-dynamics acceleration (MPD), such as VASIMR. [Sackheim et al., 2000] provides some detail of the roadmap NASA and JPL sketched during the past few years and until January 2004. Had this roadmap indeed been implemented in the US (and the publicity given to nuclear propulsion seemed to indicate it would have) US investment in nuclear propulsion would have grown rapidly. In juxtaposition, it should be noted that, with the exception of the Atomic Energy Agency in the UK, and CEA in France, the EU has no prior expertise in this area, and this state of affairs will be a major consideration when and if the EU starts looking at the nuclear option for future space mission architectures. For the time being, aside from some studies, ESA has decided to investigate the issue of NP in the context of manned Mars missions, where architectures based on chemical rockets show all their shortcomings. At the same time ESA still favors chemical propulsion for the Mars probes planned under its Aurora program [Gilles, 2004]. The US were interested instead in several different concepts based on NP, among them a reusable nuclear "space tug'' to quickly raise satellites from LEO to GEO. The impact of such a system on the GEO satellite market, of great commercial importance to the EU, does not need to be emphasized, and economic and technical studies on Orbital Transfer Vehicles (OTVs, or space tugs) continue to this day [Ortiz, 1993; Ketsdever et al., 2008]. The NASA Prometheus project linked to exploration of Europa, Callisto, and Ganymede by means of the Jupiter Icy Moons Orbiter (JIMO), and the initial phase of the Space Exploration Initiative (SEI) of President G.W. Bush contributed to prepare the public to nuclear power in space. Under a different name, this project started in 2002, with the purpose, quoting Mr. O'Keefe, NASA Administrator at that time, of battling "the distance and time dilemma'' [David, 2002]. This project was in fact called the Nuclear Systems Initiative. In 2003, after a substantial budget increase to B$ 1, it became Project Prometheus [Bates, 2003]. 2004]. More recently, Isp values above 10,000 s have been reported without any problem. This technology is in fact mature, the major extant question being thruster (cathode) life. If politically supported, JIMO would have had a positive effect on all future NEP technology. At the time, questions concerning JIMO and Prometheus were no longer the result of nuclear "fears" (a positive sign), but rather based on financial grounds. The preliminary design of the JIMO spacecraft predicted an astonishing 50-ton mass and an estimated cost (by Dr. R. Taylor, head of the Prometheus Project) of $4.5 billion just for developing the nuclear-electric engine [Reichardt, 2004]. Such figures raised and are still raising questions among analysts and review committees, and in fact led to the decision to reduce the NEP 2006 budget by $100 million, just short of putting JIMO on hold (but not to shelve it) [Berger, 2005a]. In fact, Michael Griffin, the current NASA Administrator, criticized the JIMO mission for being overly ambitious, and too costly, and hinted that testing NEP propulsion would be reserved for a less demanding mission yet to be chosen [Berger, 2005b]. The speech and executive order by US President G.W. Bush in January 2006 to focus on the Moon and Mars (the Space Exploration Initiative, SEI, now Project Constellation) effectively axed the JIMO mission and the entire NP effort, since there was insufficient funding for both initiatives. Accordingly, NASA is now concentrating resources on a manned lunar mission, where emphasis is on compact nuclear power-plants to support manned activities on the surface of the Moon or Mars, not nuclear propulsion. In fact, to ensure a robust human settlement on the Moon the consensus is that a nuclear power generator is indispensable (e.g., see [Cataldo and Borowski, 2004]). Building, testing, and orbiting such a generator has become the first priority of the NASA nuclear program (e.g., see [STAIF, 2008]). Much as missions to the outer planets are of interest to scientists (witness the enthusiasm after the Huygens landing on Titan), the public is far more sensitive to Mars explorations, hoping that some form of life may be found there. It is apparent that chemical propulsion for a manned mission to Mars would not be just risky, but also extremely expensive [Donahue and Cupples, 2000]. For a short period around 1999-2000 solar electric propulsion (SEP), riding high on its high performance in applications to commercial GEO satellites was, if not the favorite, at least one of the alternatives. However, solar-powered propulsion has inherently low thrust, and is hardly suited to explore the outer planets and their satellites, since solar power scales with the squared inverse of the distance from the Sun. This feature increases excessively the typical duration of interplanetary missions [Koppel et al., 2003]. A short history of manned Mars missions architectures in the US, from its Von Braun origins and including NTR but also chemical propulsion, is in [Donahue and Cupples, 2000]. This paper documents the evolution of the so-called NASA [Mars] Design Reference Mission (DRM) up to the latest version of 1999, also referred to as version 4.0. Much of the conceptual work for Mars missions has been based on NTR propulsion, but also on a rather improbable SEP solution using vast arrays of solar cells to generate the power needed by high-Isp electric thrusters. In fact, the status of propulsion for a Mars mission can be summarized as follows: technology-wise, alternatives to nuclear propulsion consist only of SEP or chemical rockets. Both were analyzed in depth, see, for instance [Donahue and Cupples, 2000]. Since energy density is low in both propulsion systems, the mass to orbit for a manned mission, composed of the empty spacecraft plus propellants or photovoltaic arrays, would require a completely new large launcher (dubbed "Magnum"). Calculations indicated the payload of this "Magnum" launcher should be in the 80-ton range: thus the effort required would be comparable to building a new Saturn V, but with costs reflecting the 21st century rather than the 20th. Six launches using "Magnums" are envisaged in [Donahue and Cupples, 2000] for a single Mars mission. The latest generation of expendable rocket launchers (Atlas 5, Delta 4 Heavy or Ariane 5 Evolution) may avoid building a "Magnum" from scratch, but this depends on the overall design and mass of the future Crew Exploration Module and Crew Launcher Vehicle cited in the Space Exploration Initiative of President G.W. Bush, and on its propulsion system, all in the preliminary planning stage at NASA. However, a preliminary heavy lift launcher powered by the liquid and solid Shuttle rocket engines (Ares V) has been proposed, with a first Moon trip date envisaged initially in 2015 or, more likely, in 2018: see http://www.nasa.gov/home/index.html?skipIntro=1 for pictures. In fact, SEI planning was and still is based on chemical propulsion, excluding from the start any NTR or NEP solution. Its first objective will be the Moon, by many considered a necessary stepping stone to one much farther in the future Mars mission. This notion is indeed controversial and has become to some extent an issue with the scientific community, which has little interest in the Moon. In practice, this issue is moot, given President Bush executive orders to NASA. [Coppinger, 2008], the mass savings translating into an increased liftoff payload of the order of 2.5 ton. The crew will be inside the Crew Exploration Vehicle (CEV, also dubbed "Orion'' by NASA) on top of Ares I, in essence a scaled-up and better equipped version of the Apollo re-entry capsule (thus with a very low L/D ratio and cross-range during re-entry). At the time of writing the CEV is assumed to splash down—not to land—an eerie reminder of the strategy chosen in the 1960s and 1970s. Technically speaking, the SEI philosophy amounts to a complete rejection of all airbreathing propulsion developed for TSTO concepts and high L/D gliders as well (as described in Chapter 4). The reasons for this are many, but the most important are probably a definite lack of understanding of its advantages, an excessive fear of what is still considered "unproven", and the historical investment and heritage in rocket propulsion by major world space powers and by industry in these countries. Whether these reasons are justified, or justifiable, the fact remains that as far as SEI is concerned propulsion technology is seeking what it perceives as ''safe'' solutions by going back to the good, old 1960s. In comparison with the return to the Moon initiative, the Mars design reference mission is much less defined. The EU and the US feel that much more information about the Martian environment is needed, and that is the reason for the many probes that have been sent and will be sent to explore it. The presence of water detected by the Phoenix lander may in fact make a great deal of difference. As far as the US is concerned, current plans envisage a manned Mars mission based on a very large chemical rocket launcher NASA calls Ares V [Sietzen, 2008]. The name is meant to suggest step-by-step progress from Ares I, just as occurred during the Apollo program from Saturn I to V. Standing 381 ft tall, Ares V is indeed the ''Magnum'' called for in many NASA reference missions of the 1990s and so dear to space industry (see [Mankins and Mandell, 1999] for a synthesis). Still at the conceptual design level (just recently its first stage was upgraded from five to six Pratt & Whitney Rocketdyne RS-68B LRE engines, and its SRM boosters from five to five and a half segments), it should lift some 100 to 120 ton to LEO, and 156,000 lb (70.8 ton) to the Moon [Morring, 2008]. In fact, these are preliminary figures, as work on Ares V is not due to start before 2011 [Coppinger, 2008]. The RS-68B is an engine derivation of the LOX/LH2 RS-68 engine developed by Rocketdyne since 1995. The RS-68 is the main engine of the Delta IV launcher; it is in the 650 Klb class, with a 365 s Isp at sea level (410 s in vacuo). Within this completely chemical propulsion scenario, costs are very hard to pin down. US estimates from now to, say, 2018 (when the US will return to the Moon with Ares I) are in the $200 billion to $250 billion range. These are indicative figures; for comparison, they correspond to less than what the US now spends (per year) in Iraq. Quarterly visual updates of Ares V (and Ares I) are supplied by NASA to Apple iTunes (see http://www.apple.com/search/ipoditunes/?q = NASA%20ARES). NEP-powered Mars missions are indeed very encouraging if one is willing to embrace reactor generators in the 0(100) MW range (e.g., see [Koroteev et al., 2007]). SEP is the other proposed alternative to NP. Its appeal is lower cost and known, safe solar cell technology. However, the low thrust that can be obtained with SEP is recognized as its major disadvantage: the latest manned Mars DRM (1999) envisaged a SEP-powered ship slowly accelerating by spiraling for about 9 months around the Earth without a crew. Close enough to the escape speed, the crew would board the ship by means of an ad hoc ''space taxi'' powered by a high-thrust chemical rocket. Adding to this complication, the 1999 Mars Design Reference Mission with the SEP option is designed around a 800-kW SEP thruster, requiring at least some 4,000 m2 of solar cells [Larson and Wertz, 1992]. In fact, at the time of this writing, a SEP alternative for a manned Mars mission is out of the question. The chemical propulsion option proposed in [Donahue and Cupples, 2000] treats Mars as the equivalent of the Moon in the 1950s. Somewhat simplifying, such philosophy would consist of landing on Mars as soon as possible, to show ''it can be done'', leaving it to future initiatives to gradually replace chemical propulsion with NTR and, later, with even more advanced propulsion (e.g., the VASIMR concept powered by a nuclear reactor; see Section 7.22). The obvious danger of this philosophy is likely to be the same as that of the Apollo program: after a number of very expensive Moon shots the public and the US administration lost interest and terminated it, abandoning the Moon for the next 30 years. The question is then whether the approach proposed in [Donahue and Cupples, 2000], even if financially feasible, would result in the same disappointing epilogue. Similar questions could be raised about the US Space Exploration Initiative of 2004, since an expensive new launcher or, more generally, chemical propulsion is chosen as solution. In fact, all analyses so far carried out [e.g., Borowski et al., 1999] conclude that the mass of a conventional chemically powered propulsion system for a manned Mars mission would exceed that of NTP systems. NEP systems promise to be more efficient in terms of propellant mass, although less capable in terms of thrust. In the light of the Space Exploration Initiative these questions may become moot, resolved as they might be by non-technical arguments. In 2005, Michael Griffin, newly appointed as NASA Administrator, decided that the estimated mass of the 25 kW/class ion engine vehicle for a Mars mission was way too large, requiring at least two heavy-lift launches (e.g., using Delta IV Heavy, or Atlas 5). Its cost following suit, NEP for Mars has been given the lowest priority, with power generation having the first, and NTP the second. Thus the NTP solution, the dark horse in the Mars propulsion competition, has (in principle) regained the status lost since the 1970s. In the context of manned interplanetary missions there is a critical issue that bears on arguments pro and contra nuclear propulsion, and that is the question of health-damaging effects due to extended periods in space. Space radiation is a catchall name, including energy in the form of photons as well as particles. Our galaxy and the Sun are the major sources, but radiation is also created near the planets posses sing an electromagnetic field, such as the giant planets and of course the Earth. Galactic sources are responsible for the so-called cosmic (now: galactic) rays; the Sun produces the solar wind (mostly protons) and, occasionally, intense solar flares, still fairly unpredictable. Cosmic (or galactic) rays are mainly protons and heavier nuclei, and can reach extremely high energies (their velocity may reach >0.999c). The energy spectrum vs. flux follows a power law as shown in Figure 7.19. The higher energies are believed to be associated to radiation from far-away galaxies. The mechanism creating galactic rays is still a subject of investigation [Cronin et al, 1997; Plaga, 2008]. What is of interest to space propulsion is the fact that, because of their energy spectrum, both cosmic rays and solar protons are harmful to humans (see Appendix A for details). Below roughly 2,000 km from our planet surface the Van Allen belts are an effective electromagnetic shield. Above, and away from Earth, radiation may pose severe risks to a crew not only during travel, but also while on planetary surfaces (inside habitats). Planning radiation protection is further complicated by solar flares, when the flux of solar protons can increase by orders of magnitude, depending on how close the spacecraft is to the Sun. A telling comparison between the energy spectra during a solar event and the (steady) galactic radiation (at 1 AU) is in [Hayatsu et al., 2008]. For instance, the dose equivalent from the solar event of January 20, 2005 was 220mSv, to be compared with the 2.4mSv of the 1-year natural background dose on Earth (see Figure A.16). The galactic radiation contribution is smaller by a factor of 102 to 108, depending on the energy spectrum, but still tens of times larger than the natural background dose. The experience gained by Soviet cosmonauts on MIR indicates radiation and microgravity have other, subtler effects besides the loss of bone and muscle mass, cell damage, and enzymatic changes. Thus, an open question in interplanetary space travel is how to shield a spacecraft from solar and galactic radiation. In Section 7.4.1 basic information is provided for shielding a nuclear reactor, an easier task. While the same physics applies, the difference stays in the magnitude of the energy involved. Work is in progress in this area (e.g., see [Atwell et al., 2006; Tripathi et al., 2006; Destefanis, 2008]); the radiation problems faced by a crew during a Mars expedition have been examined in great details in Russia [Tocheny, 2000], but a "magic bullet'' capable of fixing them still has not been found. In fact, although at their high energy end fluxes are far lower than anything man-made, galactic protons may reach energy of the order of 1020 eV: nothing comparable has ever been created in particle accelerators (the Large Hadron Collider at CERN creates O(TeV) particles; the energy of neutrons or gammas in nuclear reactors is limited to perhaps 10 MeV). Thus, space is a very harsh environment for humans, but this has not been appreciated until recently (witness the scarcity of dedicated papers in international conferences), when space radiation shielding began to emerge as a major challenge.